And here lies the fate of this monstrosity of a cake. After seeing a photo of a rainbow cake posted on my tweet feed by @felkhoo, and my curiousity of how it would taste like..i thought, heck i would give it a go. Surely it couldn’t be that bad. I had big plans that Thursday arvo. I intended to back a 6-layer cake with one pan AND cookies to try my new alphabet stamps. Obviously that wasn’t happening with an 8-month-old. Duh. After baking for nearly 4 hours with lots of washing up, the cookies definitely wasn’t happening. But Ollie was nice. He napped for 1.5 hrs which gave me more than enough time to make the batter and sort out the colours AND even bake the first layer. Sweet! I started off with a basic recipe for the cake layers from the Martha Stewart website. My recommendation is to try the cake with more cake pans. My cake turned out quite dense cos most of the air bubbles had dissipated after sitting out there for too long. I also started with four food colourings for all 6 layers: red, orange, blue and yellow. Just a matter of tweaking to get the shade you like! The lemon swiss meringue buttercream was a whole other ballgame together. I was worried about cooking the eggwhite into an “egg-drop soup” when it was cooking over the stove to dissolve the sugar. I got sick of seeing so much eggwhite go into the buttercream: 9 for the layers & crumb coating, and another 5 for the outside layer. Yikes…and earlier I had used 5 eggwhites for the cake layers. That’s 19 yolks wasted!! My aunt just said I could have used the yolk for kueh lapis. I would..if I had more time to bake the next day. Haha. Bringing the cake out for grandma’s birthday dinner was an amusing affair. 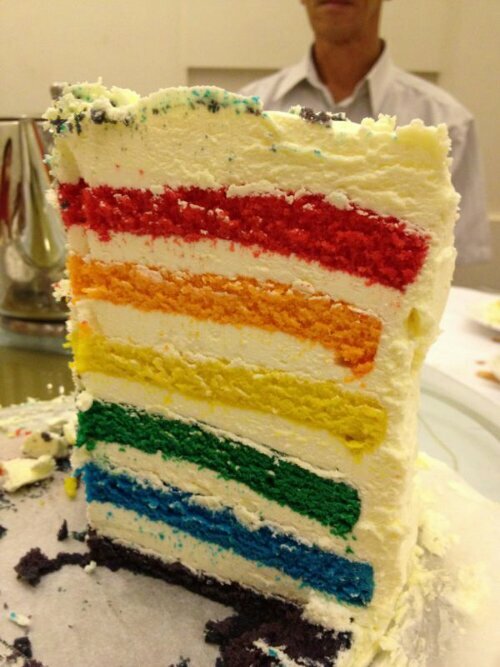 No one knew what a rainbow cake was..and all they saw was a plain white huge/tall cake. After singing her a birthday song, and getting her to symbolically cut into the cake, I was tasked to slice the cake for everyone since I baked it. Suuuuure. Cue first slice out and then, “waaaah“. 原来你的蛋糕有内涵。And out came the phone cameras..thanks to Donald who helped me take multiple shots of the cake whilst I was handing slices of it out! Overall, it wasn’t too bad. I would like the layers to be fluffier and the buttercream to be alot less sweet but hey, it is a meringue buttercream afterall. I had fun baking it and I don’t think it will be the last!